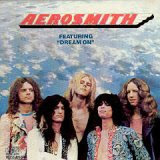 Hall of the Mountain King: Still Spinning: Aerosmith - "Aerosmith"
Most people would probably consider Aerosmith's "Toys in the Attic" the band's best record, and you could certainly make a case for that when you hear the mega-hits "Walk This Way" and "Sweet Emotion" in regular rotation more than 30 years later. For me, though, "Toys" is No. 3 on the list of Aerosmith records, behind 1976's "Rocks" (one of the finest rock albums of all time) and the self-titled debut from 1973. I like debut records in general. Sure, most bands take three or four records to really polish their sound and get that big breakthrough, and that's exactly why I prefer the debut. The debut is raw. The debut is real. The debut has all of the energy and desire of the band packed into it, even if it doesn't have all of the talent they'll eventually display. Aerosmith's debut is no different, though it did spawn a few certified classics. We'll go ahead and get those out of the way. There's never been a much better power ballad recorded than "Dream On" (though it took a few years before people caught on to it), and "Mama Kin" is quite simply one of the greatest raw, hard rock songs ever written. Those two songs alone make this a great rock record, but dig a little deeper, and you'll find a lot more to like. No less powerful is the funky, bluesy groove of the opening of "Movin' Out," another personal fave. Joe Perry's twangy riff paired with Steven Tyler's countrified vocal inflection on the opening make it practically impossible to get out of your head once you hear it. The blues influence that would become more and more prevalent on their 1970s records really shines on "One Way Street," with Tyler at times going into falsetto hysterics over the laid back groove provided by the rest of the band. Finally, there's the cover of Rufus Thomas' "Walkin' the Dog," which is one of the more interesting tracks here. It's a very funky number, almost a dance song, and Joe Perry's muted string rakes in the chorus are almost like a forerunner of the record scratching that arrived with hip hop in the 1980s. Admittedly, much of this record was an effort in Stones worship, but there are strong flashes of what the band would become, with shades of blues and even jazz swinging through the songs here. As great a record as "Toys" is, given the choice between the two, I'll take this one every time. It's probably Aerosmith's most underrated effort. Hear a sample of "Walkin' the Dog." Still Spinning is an occasional feature about an older record that still gets regular time in my CD player.